By all accounts, the 2008 presidential campaign was one of the most exciting and intense elections in years, and with the election of Barack Obama as the first African American president, certainly historic. Award-winning journalist Roland S. Martin was there from the beginning, watching, reporting and commenting on it all. Whether broadcasting from Springfield, Illinois in the cold when Obama announced his candidacy, to weighing in on the controversial sermons of the Rev. Jeremiah Wright, to witnessing the nomination of Obama as the Democratic nominee in Denver and shedding tears with millions on Election Night—albeit from the set of CNN—Roland S. Martin was always in the thick of the most important moments of the campaign. Taking all of his reporting from the election, whether on CNN, TV One, WVON and t he “Tom Joyner Morning Show,” Essence blog and magazine articles, and his syndicated columns, The First: President Barack Obama’s Road to the White House as originally reported by Roland S. Martin, takes us back to the ups and downs, high and lows, of the campaign. 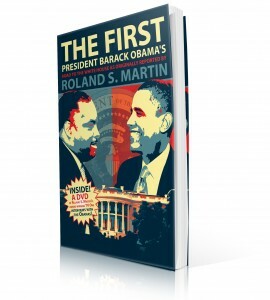 Combined with his own behind-the-scenes accounts, and original reporting with a litany of celebrities who were heavily invested in the election, including Hill Harper, Jessica Alba, Spike Lee, Common, Blair Underwood, Vanessa Williams, and Holly Robinson Peete, Roland S. Martin’s The First will clearly serve as a historic documentation of the history-making election of President Barack Obama.